Apple's annual capital expenditures report came in $2.3 billion higher than anticipated, which has led one analyst to believe Apple could have put a significant amount of money into key but struggling supplier Sharp. In an analysis posted on Wednesday, Horace Dediu of Asymco noted that Apple spent one-third more than it expected in capital expenditures in fiscal 2012. And some of the acquisitions made by Apple were made through what he called "uncharacteristic or unorthodox means." Apple had originally forecast in October of 2011 that it would spend about $8 billion on capital expenditures. But the final number came in at $10.3 billion, with nearly all of the over-spending related to "product tooling, manufacturing process equipment and infrastructure." Dediu's theory is that Apple may have placed a significant investment in Sharp, which provides display panels for devices like the iPhone and iPad. Sharp has also found itself in financial distress, and earlier this year was in line to take a $1 billion investment from Foxconn  a payout intended to build a new LCD plant to boost production for Apple products before the deal fell through because of Sharp's poor finances. "My guess is that these attempts to shore up Sharp are directed by Apple to ensure both continuity of supply and a balanced supplier base (offsetting Samsung, another supplier)," Dediu wrote. "If Sharp were to enter some form of bankruptcy, the key plant(s) used in producing screens for Apple might be 'up for grabs' by creditors and they might be taken off-line, jeopardizing apple's production capacity, irrespective of contractual obligations." 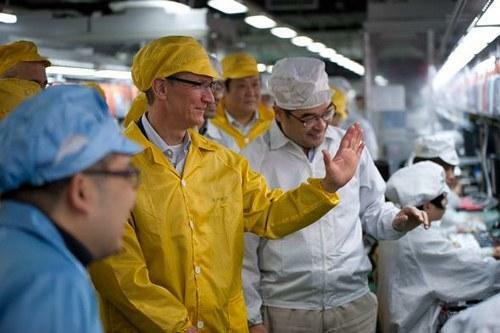 He hypothesizes that Apple financed the deal in exchange for preorders of new components. In this scenario, Apple may have paid for a Sharp screen production line by prepaying for components from the company  an investment that would show up on Apple's annual 10-K filing. Apple's filing, made public a week ago, also revealed that it increased spending on research and development by almost $1 billion. The increase to $3.4 billion in its 2012 fiscal year represented growth of 39 percent from the year prior.